What is intended as a relaxing vacation to Savannah , Georgia for Claire Donnelly wuickly turns into one of adventure and mystery. Upon her arrival, Claire starts experiencing unusual visions, which grow to vivid depiction of visions of evil forces living among the citizens of Savannah. 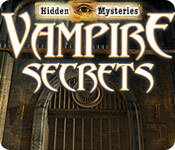 Dark Shadows: A Vampire's Tale mixes hidden object gameplay with adventure elements. The dark and mysterious storyline will capture the attention of casual gamers and vampire fanatics alike.